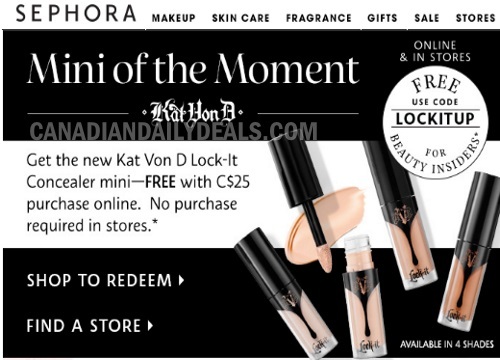 Sephora is offering a Free Kat Von D Lock-It Concealer! This applies free in-store (no purchase required) or with a $25 online purchase for a limited time! Normally you have to buy something in-store to get this, so I am thrilled that they are starting freebies like this, hopefully they keep coming! Enter the promo code LOCKITUP online at checkout or show the email from Sephora's Beauty Insider newsletter to get in-store (this is also showing on the Sephora mobile app, I got it last week). Choose from one of 4 shades available.